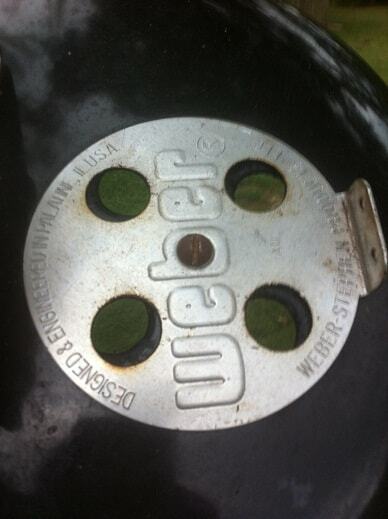 I wanted a thermometer for my Weber Jumbo Joe. The Jumbo doesn’t need a thermometer; I just wanted to trick mine out a little. 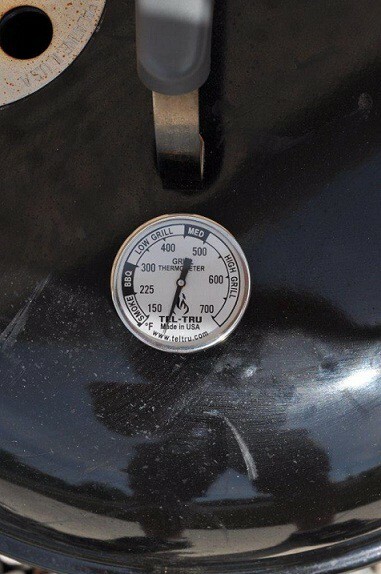 After a little consultation with a buddy and a little forum searching I am pleased to offer two ways to install a thermometer on a Weber Jumbo Joe! Both methods use Tel-Tru thermometers which are very accurate (+/- 1%). This post features two Tel-Tru models. 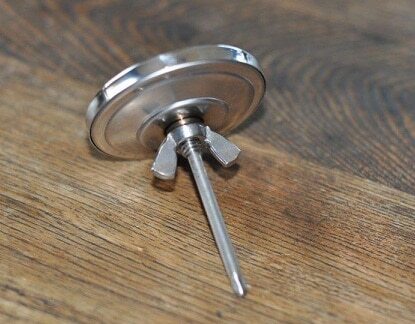 Both have a 2 inch stem, fit a ¼ inch hole and come with a wingnut to secure the thermometer in place. Both are great, they just look a little different. 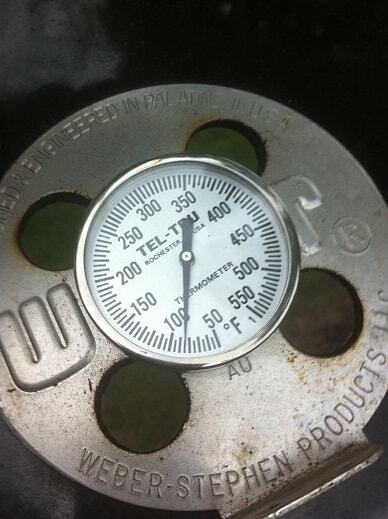 My buddy Davey sent me some pictures of how he installed a Tel-Tru thermometer on his Jumbo. He wanted his thermometer to be close to the lid handle. He didn’t want the stem of the thermometer to get in the way so he put it on the highest part of the lid. Makes sense to me. Put some masking tape over the spot where you want to place the thermometer. Using a power drill and a regular ¼ inch drill bit, slowly drill until the bit “takes”. The masking tape will keep the drill bit from scratching the surrounding surface if the bit gets off center and wobbles around. Once the bit “takes”, apply a little more power and finish drilling the hole. Insert the Tel-Tru thermometer and secure with the supplied wing nut. Davey isn’t worried about the edges of the hole with exposed metal rusting. As long as the Jumbo gets plenty of use the smoke and vaporized meat goodness will seal everything up pretty tight. 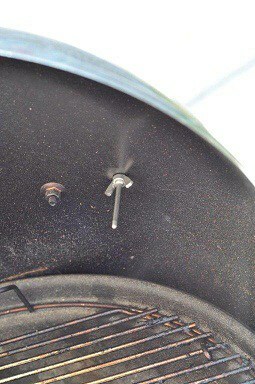 Davey went with the Tel-Tru BQ225 Barbecue Thermometer . A great big THANK YOU to Davey for sharing his pictures! 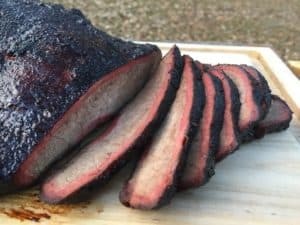 This technique was borrowed from “Dan S” over at the Virtual Weber Bullet forum. This technique takes advantage of the fact that the top air vent is secured by a ¼ inch screw. This is the approach I used. Remove the ¼ inch screw that holds the top air vent in place. 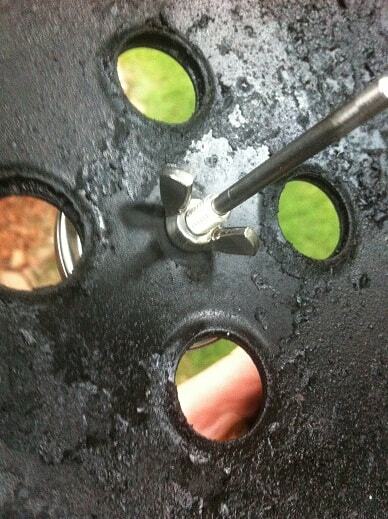 Replace the screw with the Tel-Tru thermometer and secure with the supplied wing nut. I went with the Tel-Tru BQ225 Pit Thermometer . The biggest difference between these two thermometer installations is location. I can see pros and cons of both locations and really can’t decide if one is inherently better. What do you think; which is location would be better for the thermometer?